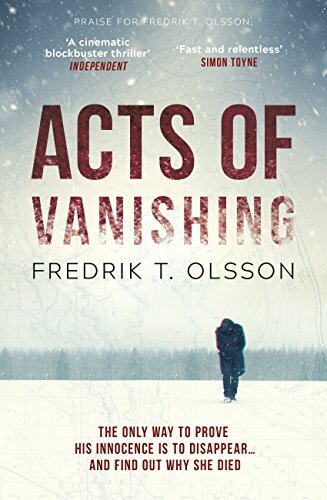 Acts of Vanishing is a exciting new Scandinavian thriller, the second in a series featuring William Sandberg. Told from multiple viewpoints in a cinematic-style, this who-dunnit will appeal to anyone who doesn’t want to get bogged down with the psychology or reasoning behind the main characters decisions and just wants the thrill of a fast-paced action story. The concept of the book is an interesting one, if straying into the realms of science fiction. It raises questions of political morality, conspiratory theories, spying, politics and the use and abuse of the internet. The story starts with the city of Stockholm plunged into darkness with a black out of radio, internet and phones. No one knows how or why the power cut has happened and the fear is that terrorists are behind it. William Sandberg, is a disgraced military cryptologist who has been contacted by email immediately before the blackout. His former colleagues in the state military police aware of this correspondence assume he is in some way connected to the terrorist cell and are after him. William’s task throughout the book is to prove his innocence by finding out who is really behind the power failures. It soon becomes clear that they are happening in strategic places across the world, not just in Stockholm. William needs to find the link but everywhere he goes someone seems to be watching him, following his every move and putting him in mortal danger. His estranged wife Christina, a newsroom journalist also tries to piece together what’s happening. She has a terrible feeling that somehow her ex-husband and their daughter Sara (who the reader knows from the start will die soon) are involved but she wants to believe they are innocent. People that William knows are being killed. As the UK military get involved, things become more complicated and William realises the entire world is on the brink of disaster and time is running out.